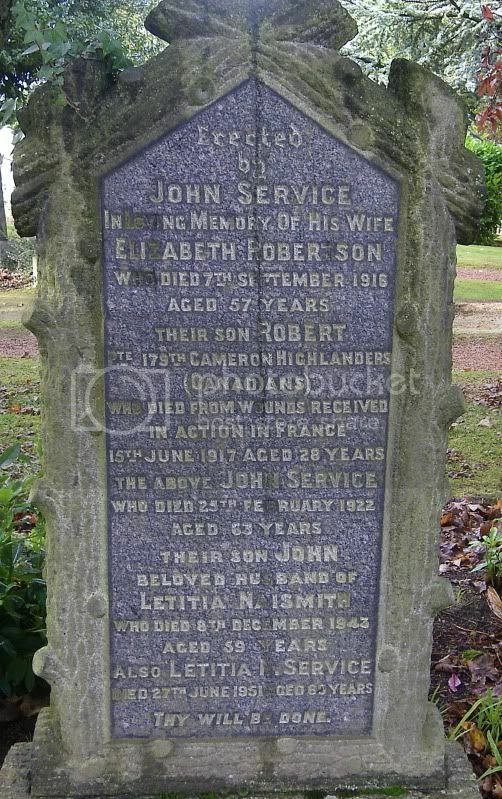 Additional information:	Son of John and Elizabeth Service (nee Robertson). 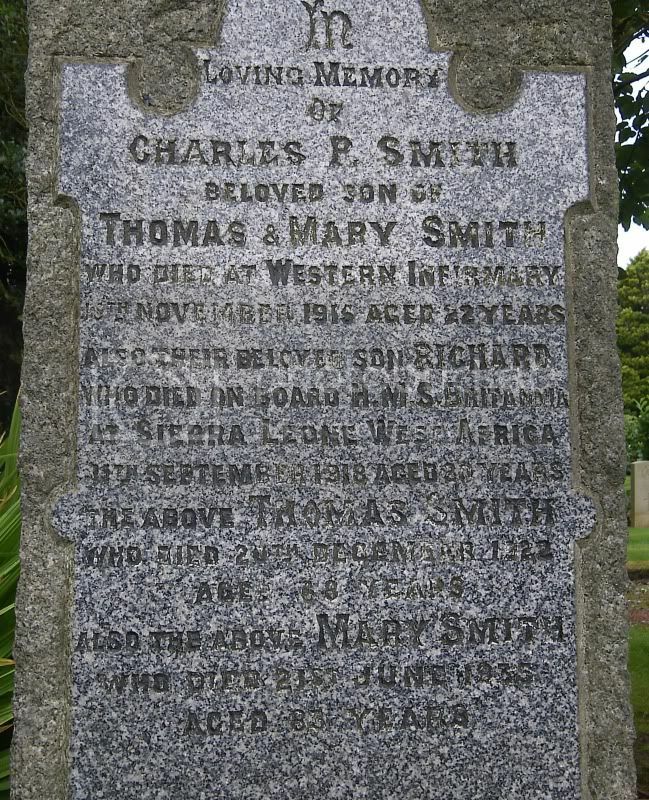 Native of Wishaw, Lanarkshire, Scotland. Grave/Memorial Reference:	II. A. 37. 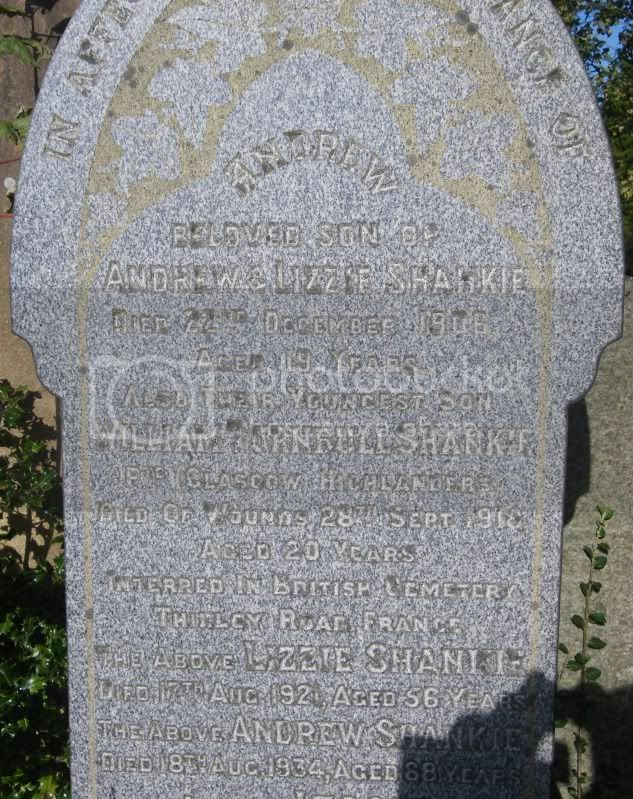 Additional information:	Son of Andrew and Elizabeth Mitchell Shankie, of 1024, Pollokshaws Rd., Glasgow. A Goods Clerk, Caledonian Railway. Grave/Memorial Reference:	8. C. 21. 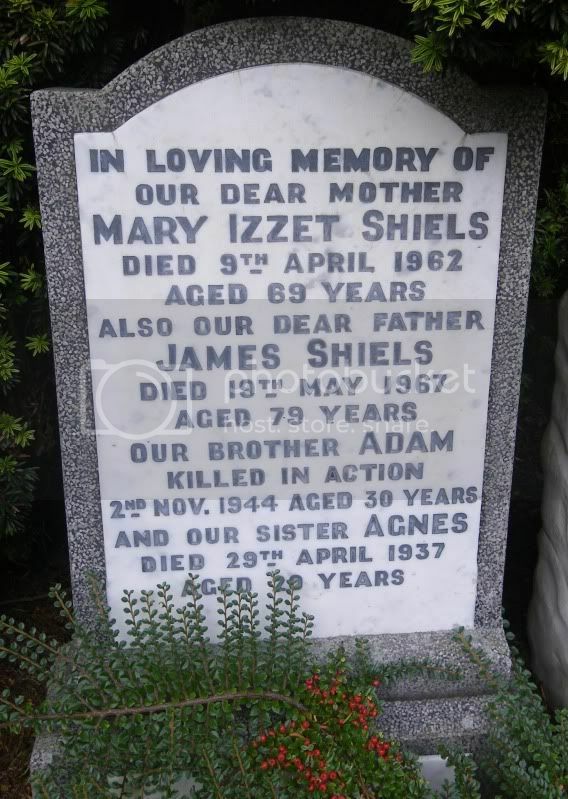 Additional information: Son of James & Mary Izzet Shiels. Grave/Memorial Reference:	1. E. 9. 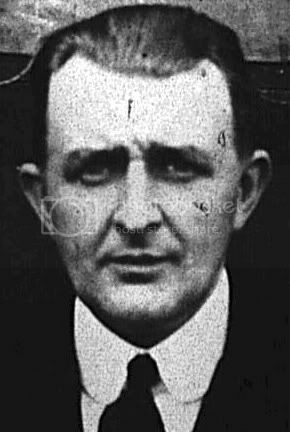 Conrad Bona, son of Otto & Letitia Bona, husband of Maud Lang. 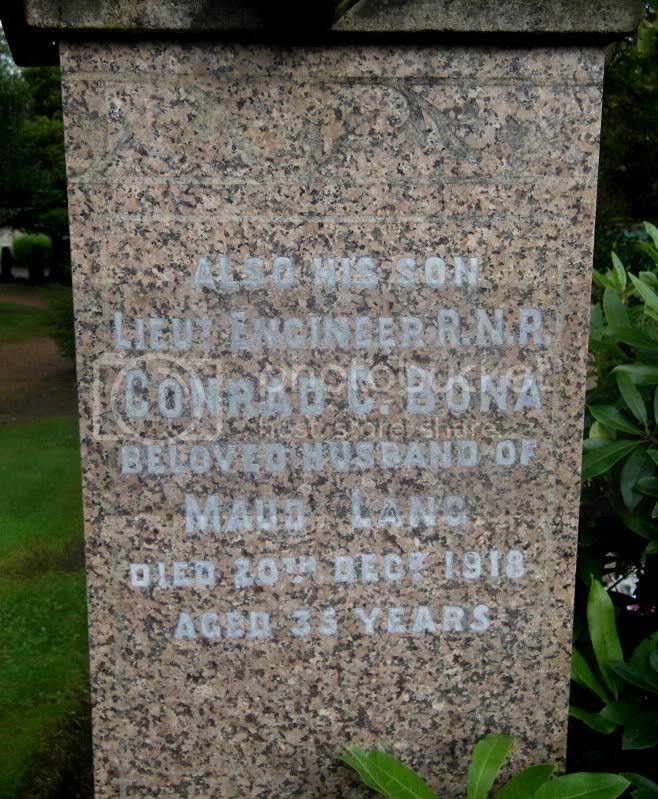 "Conrad Carl Bona died 20 December 1918 at Great Crosby near Liverpool. Death is registered in Oct./Nov./Dec/ deaths register. 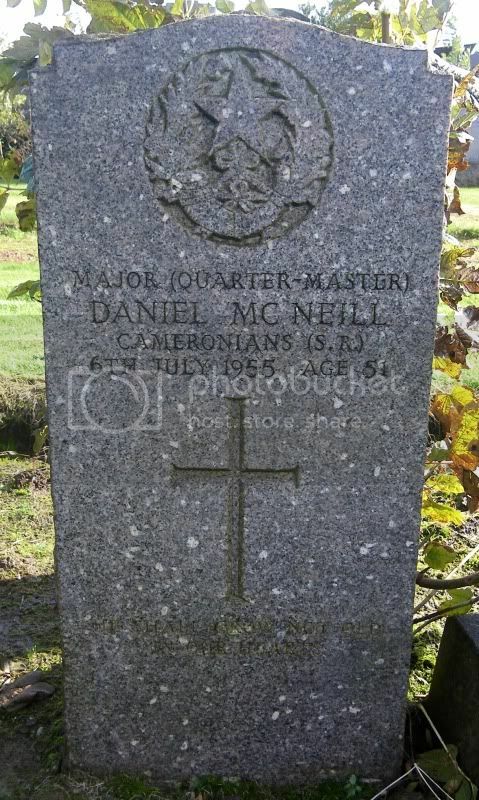 He is listed as aged 35 years, District..West Derby..Volume 8b and page 503. Bona, Conrad Carl of HMS Aquitania, England, Sub Lieutenant RNR died 20/12/1918 at Great Crosby near Livwerpool. Confirmation of Maud Elizabeth Lang or Bona widow. Sealed London 20 August. That must be his will "signed off" and stored somewhere or maybe someone knows better what this all means!" "A medal record exists for Bona which suggests he was in the Mercantile Marine. RNR men are also simply civilians, unless embodied into the RN. During WW1 civilians do not qualify as war deaths, except members of some organisations, in certain circumstances only. 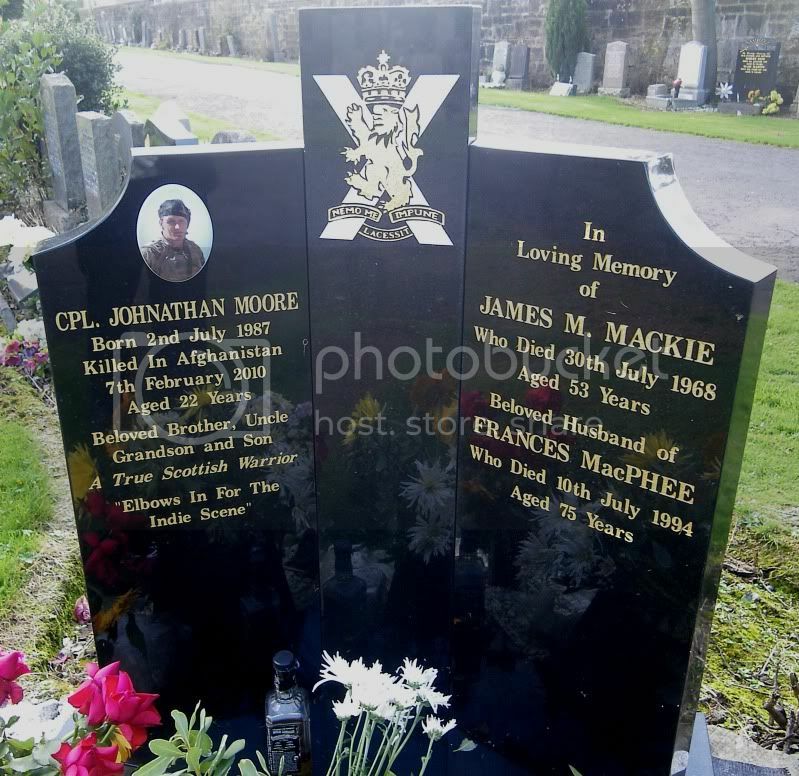 That being the case Bona could only qualify for war death status if he had died whilst working under Royal Navy control, and only if he died of war related causes, generally this would involve hositle action by an enemy. He died after the war ended. The probate record also suggests he was a civilian. It mentions HMS Aquitania. This is the Cunard liner RMS Aquitania ( sister ship of Lusitania), which was in government service as a hospital and later a troop transport. It appears she was engaged transporting Americans home immediatly after the Armistice. You would need a DC and service details in order to get anywhere with this. 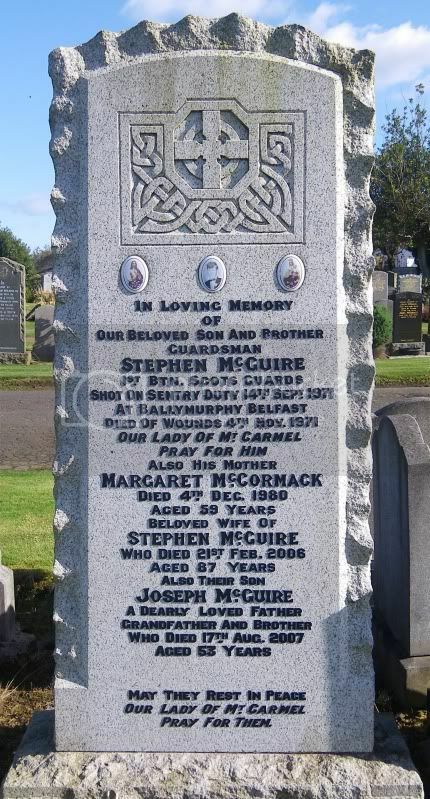 Gravestones are often wrongly detailed by families, as you will know. Often the facts were " improved " by relatives." R.Q.M.S. 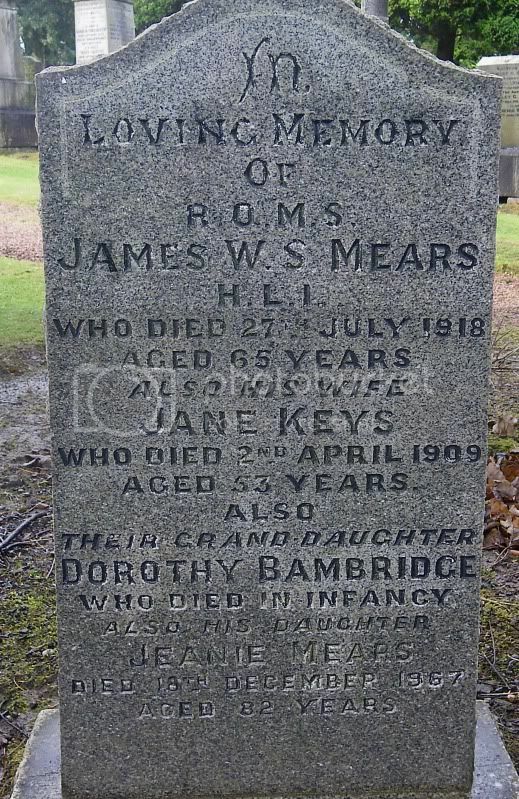 James W. S. Mears, H.L.I., died 27th July 1918 aged 65. 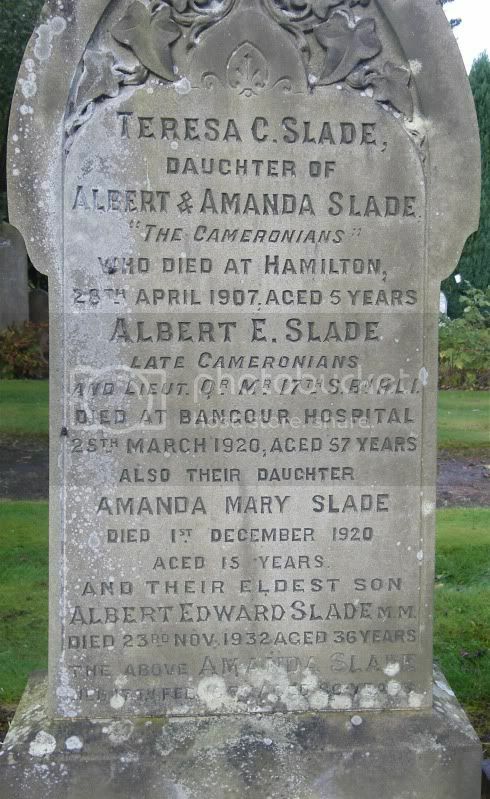 Albert E. Slade, Late Cameronians and Lieut. Qr. Mr. 17th S. Bn. H.L.I. Albert Edward Slade, M.M., died 23rd November 1932 aged 36 years. 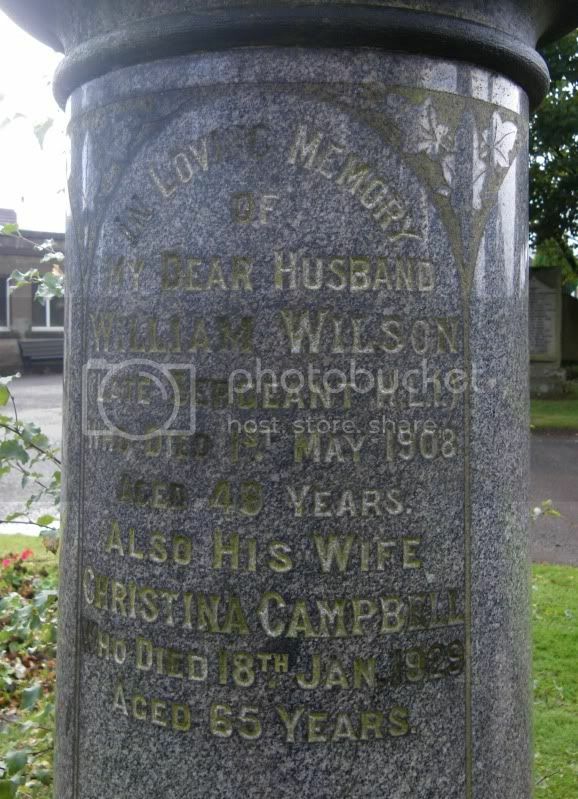 William Wilson, Late Sergeant, H.L.I., died 1st May 1908 age 49 years.